2000 to 2010 was a remarkable decade for real estate. It started with the dot.com bubble and ended with the putative recovery from the Great Financial Crisis. The period in-between featured the world's first coordinated real estate boom and slump. This book is based on a series of briefings on the relationship between macro economic events and real estate markets in the era of globalisation that covered the period. Collectively they offer unique insights, new ideas and practical approaches to real estate economics, grounded in the day-to-day realities of investment, development and fund management operations in a leading international property company. All the briefings are based on research conducted by a sophisticated in-house research team with expertise in macroeconomics, urban economics, financial economics and econometrics, led by a well- known specialist in the field. The topics highlight the relationship between real estate markets and global economic and political events – an area not well covered by academic journals. A compelling introduction considers the dramatic boom and slump in real estate values that led up to the Great Financial Crisis. The briefings are then presented, grouped into broad themes: macro economics and real estate; GDP, recessions and inflation; REITs; construction; Asia; retail, offices and housing markets; the formation of investment yields. A final chapter considers the medium-term future for real estate in the context of the ongoing financial crisis. Topics span the key sectors of office, retail and residential real estate in over 40 countries, with a focus on private sector investment, development and management. The perspective is long term, reflecting Grosvenor's unique position in real estate as a privately owned group. 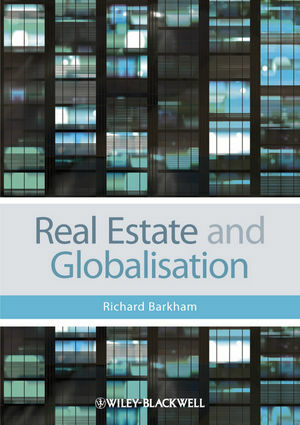 The author provides a commentary on each topic, giving context to the research and the implications for strategy, drawing out two unifying themes: the effect of globalisation; and the importance of macro economics and geo-politics in real estate research. Together, the briefings offer a penetrating analysis of real estate markets in the era of globalisation and financial crises. The era of crises is far from over, and Real Estate and Globalisation provides invaluable insights for property professionals worldwide – developers, occupiers, investment analysts and planners – on the nature of the processes that create such intense property market volatility. The book is also a unique source of guidance on practical property research for final year undergraduates and postgraduates on property courses, as well in geography, planning, architecture, and construction. Dr Richard Barkham MRICS, Group Research Director, Grosvenor, and a Director of Grosvenor Fund Management, heads a global research team of ten full time real estate economists. He has an extensive track record of highly cited real estate research and is a regular presenter at major conferences on real estate trends.